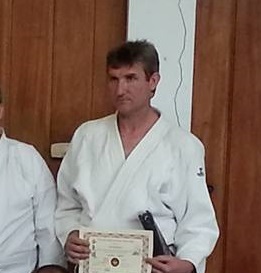 Simon Brades (2nd Dan Atemi Jutsu, 2nd Dan Aikido) has many years martial arts experience, trying Judo, Karate, Taikwondo and JuJitsu before joining the IBF and studying Atemi Jutsu and Aikido under the late Jason Peak sensei. 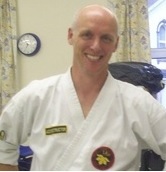 Simon believes in daily practice and enjoys training with martial artists at other clubs and attends numerous martial arts seminars and courses. In 2013 and 2016, Simon was able to fulfill a long held ambition and practice Aikido in Japan. Simon currently manages the club on behalf of the members. 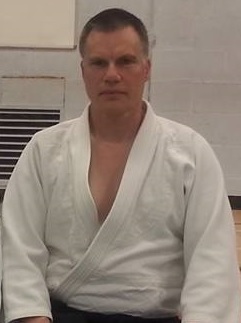 Istvan, 3rd Dan Aikikai, 3rd Dan IBF, 1st Dan Real Aikido. 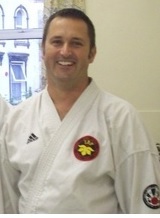 Istvan has many years of experience and has trained with many well known instructors, such as Tamura and Tissier sensei. Istvan ran his own club in Serbia for 15 years, prior to moving to the UK and is currently leading instruction in Aikido within the club. Shane, 2nd Dan Atemi Jutsu, 1st Dan Aikido has previously trained to be personal trainer and army PT instructor and brings this experience to his martial arts instruction. Currently Shane is in charge of the juniors training. An all rounder, with good ukemi skills and technical knowledge, Shane also makes sure we have a good warmup and cool down, reducing the risk of injury and post training stiffness. John, 1st Dan Atemi Jutsu, 1st Dan Aikido is an expert on the IBF version of the kime no kata and in 2014 demonstrated it at the WBKA Martial Arts Festival in Adelaide, Australia. John can also often be found helping the beginners learn the basics of on a club night. John is also keen to learn weapons techniques and is a Sunday morning regular.